Q: How do I determine if my material is accepted as recycling? One of the first things you can do is use our Material Guide. It contains practically every item you could think of and will give you instructions of whether the material is recyclable or not. Q: Can I put all accepted recyclables on my curb for pickup? Each of these items will have special disposal methods, whether it be at a local recycling depot, or a specialized area that services these particular items. Please visit our Recycling Guide here to find your material and its preferred disposal method. Don’t just throw everything in the blue box! Q: How do I set out my recycling on the curb? To ensure your materials are collected, place your items out on the proper side of the road by 7:00am on your designated collection day. 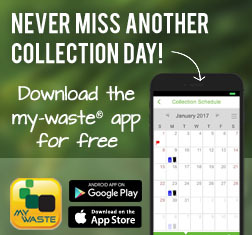 We realize that you may get into a routine as to when your materials are collected, but those collection times can be altered on a daily basis due to weather or employee absence. Please do not hide your containers. Be sure not to place it behind an obstruction where it cannot be clearly seen from the road. The blue box is a signal for the driver to stop. Make sure your containers are clean. Collection of materials from a dirty container can sometimes be a downright sickening experience when maggots and other creatures have to be dealt with. Do not make our employees deal with materials that you yourself would not want to handle! If you have a mail box, be sure to place your containers beside your mailbox instead of in front of it. Flatten all of your boxboard & cardboard. Help us make our recycling program as efficient as possible by keeping materials compact and broken down. Stuff the flattened material into a larger boxboard box! Remove bins from the curb after service. Items cannot exceed 45lbs , 30 gallons or 30 inches in length if using a blue box. You may notice on our website, in newspapers and other printed material that the Bluewater Recycling Association does something called ‘Automated Collection’ to certain areas. It is a safer, more efficient way of collecting materials which has countless benefits for both the resident and our operations. Learn more about Automated Collection here. Q: When will Automated Collection be in my area? We aim to convert up to 80% of our customers to fully automated collection by 2015. Each municipality is handled on a first come first served basis. Q: Where do I find my garbage collection schedule? Q: How can I replace a lost or broken Bluebox & Cart? We understand that unfortunate circumstances may occur where a Bluebox or cart may get lost, stolen or damaged. If this is the case, click here to fill out an order form to have it replaced immediately. Q: Where can I buy recycling supplies? If you need additional recycling supplies or extra boxes and carts, then check out our supplies .PDF right here. You may order any of these items by calling or e-mailing our facility. Availability may fluctuate. Q: Why are some paper, metal and plastic items not accepted in the recycling bin? There are some obvious materials that simply cannot be recycled, though often some items may look recyclable from the surface. These items cause the most frustration and confusion from residents, especially because they are trying their best to recycle materials and wake up to find these materials left in their blue box. Polystyrene: Also known as Styrofoam, it is labeled as identification loop #6. Though it has a plastic identifier, it is NOT recyclable. Polystyrene only has one available end market with limited capacity. This limitation combined with the potential of food contamination, and the low weight density of these containers make them economically unfeasible for recycling. Coffee Cups: These types of containers are treated with a special coating to prevent liquid inside from seeping out, and therefore cannot be mixed with other paper products. For the same reason we cannot take frozen concentrate juice containers. Keep in mind, we have recently upgraded our entire Material Recovery Facility and found new end markets to certain items which until 2010 were not accepted. These include Aseptic containers, Gable Top containers, Clam Shell Containers, Blister Packaging, Ketchup Bottles, and most other plastics. We aim to continuously accept more materials over time in an effort to produce zero waste! Q: Do you have more specific or periodic recycling information? Q: How do I report a missed collection? You may call our office at 1-800-265-9799 extension 228 or email us. Q: What happens to the materials after it is collected? The recycling process is a fantastic system in which a material is collected, sorted, processed, and sold to an end user market which then takes that material and reuses it in the form of new products. Click here for an informative double page from our 2010 newsletter outlining the Material Recovery Facility. For information on where end product goes, check out the ‘What We Do’ section of our website. Q: Does it cost to recycle? While most municipalities do not specifically charge for recycling services, it costs approximately $50 per year to provide curbside collection service. Most of the costs are collection costs. In general, the costs related to the program administration, education, and processing of materials are covered by the sale of the recyclables. Q: How should I set out my recyclables? Your set out will depend on the type of collection system used to service you. This information is available from your municipal page located under the My Services section here. Q: How is the material separated in the truck? This depends on the type of vehicle used to perform your collection. Click here to see the different vehicles and learn about their unique characteristics. We are conveniently located in Huron Park, which is central to our collection areas. Click here to visit our contact page which has our office location and hours. We have visitor parking and a drop off area for your materials. Q: I have spotted a website error, what do I do? We would love to hear from you! Our goal is to make the online experience a hassle-free, simple to use system. If there is a page error, typos, mistakes or issues then feel free to contact us!